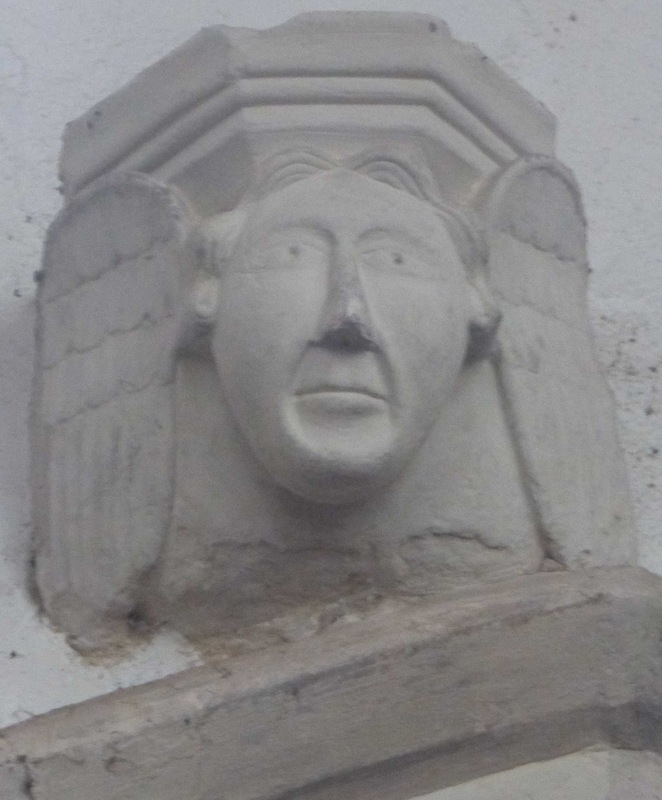 Enter Great Hormead church and look up and slightly to your right. 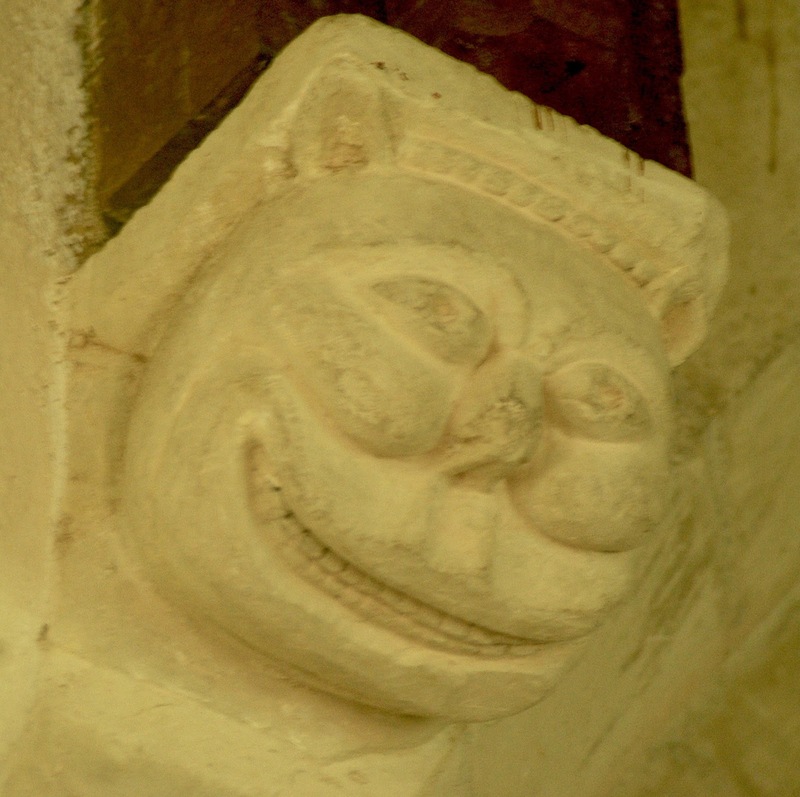 This curious cartoony cat-human hybrid creature has been grinning down into the south aisle for about seven hundred years*. 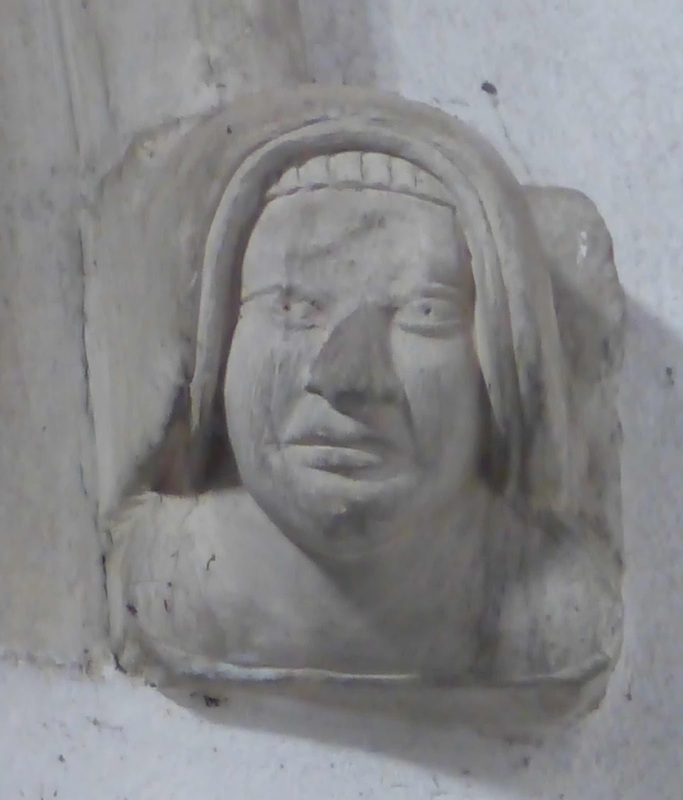 How would you describe its expression? I can't decide. Is it cheerful? The smile looks too fixed, more like a grimace. Gleeful? Possibly, though perhaps with a hint of malice. Or is there even something a little sinister about it? I admit I find it a bit unnerving. This chap is using his second and third fingers to pull his mouth into a gurn (or he could be whistling) while simultaneously inserting his first fingers into his nostrils; not a very welcoming gesture, though you have to admire his gusto. 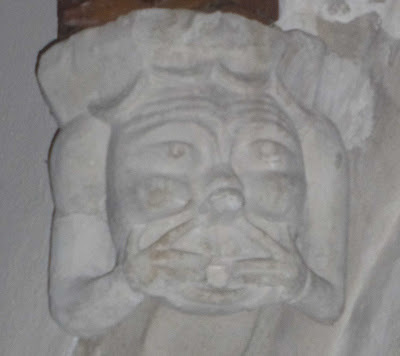 This figure in the NE corner appears to be angry and has his mouth agape, as if he's shouting, but it's stuffed with two disc-like objects, I assume flowers. A very odd conceit; was the sculptor possibly making some sort of visual pun on 'flowery language' (as a euphemism for swearing)? He has an ear like a quotation mark. 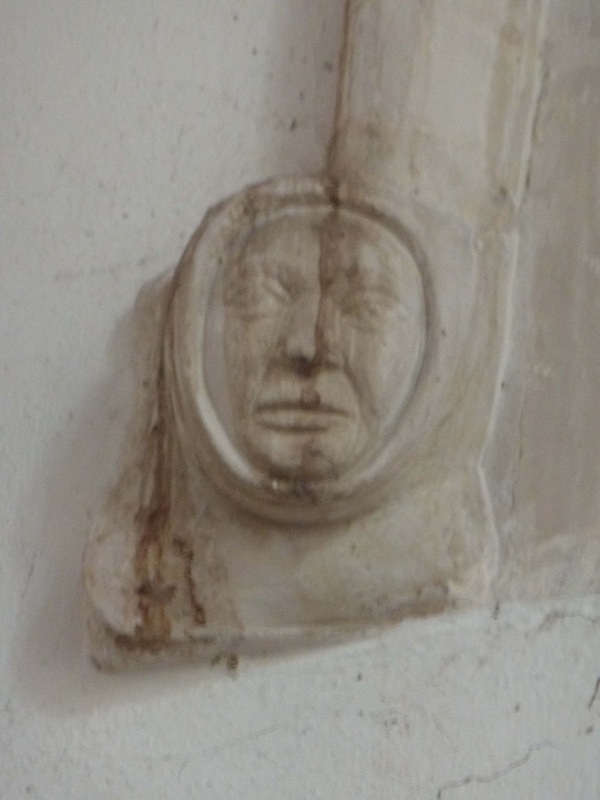 This head in the SE corner is much the least individual and interesting of the eight. 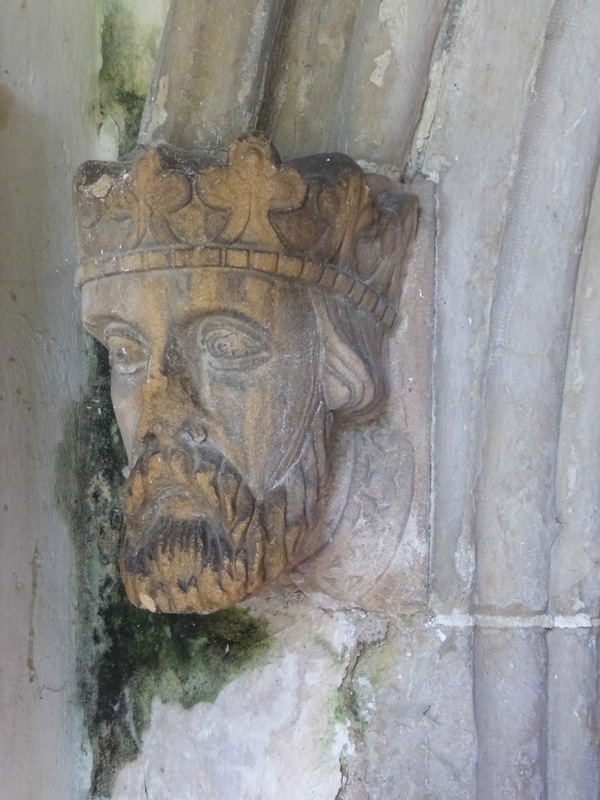 He appears to be wearing a crown, and is thus presumably a king. 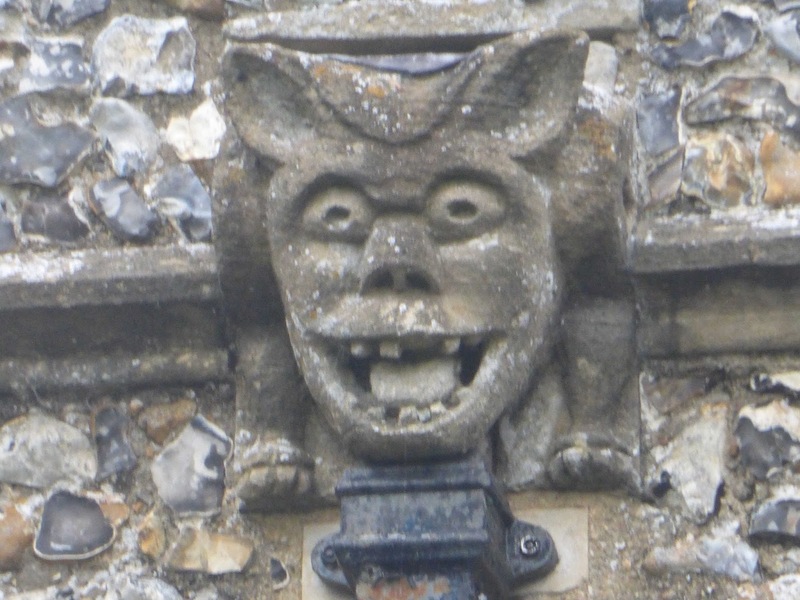 This silly grin makes him appear a foolish fellow. On the other hand, this fellow is scowling (as if in reaction to the drip of paint or wood treatment that's running down his nose). His hair terminates in tight curls. 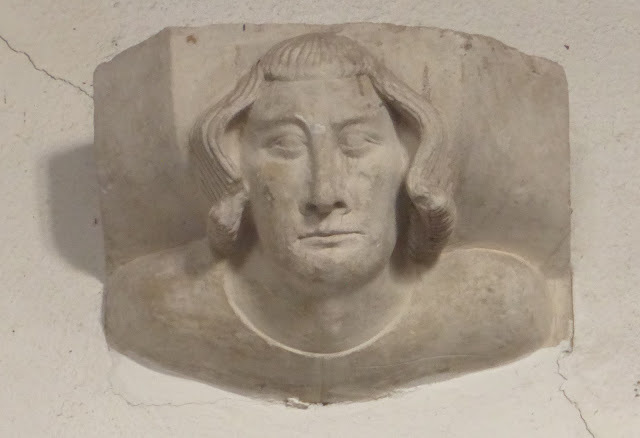 His very pronounced cheekbones suggest he was carved by the same sculptor as that of the first, second and fifth corbels above (and he shares the furrowed brow of the second and fifth). 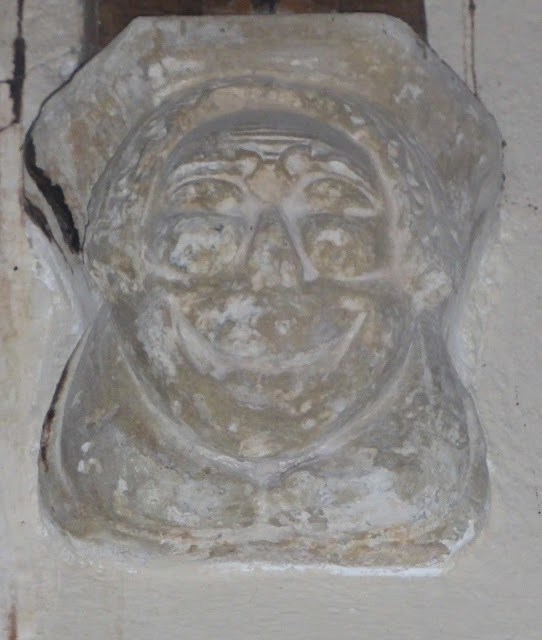 In the SW corner, to the left of the Brand monument, is this goofily grinning lopsided character, another figure that could have come from a cartoon (indeed, he looks like Ernie from Sesame Street). 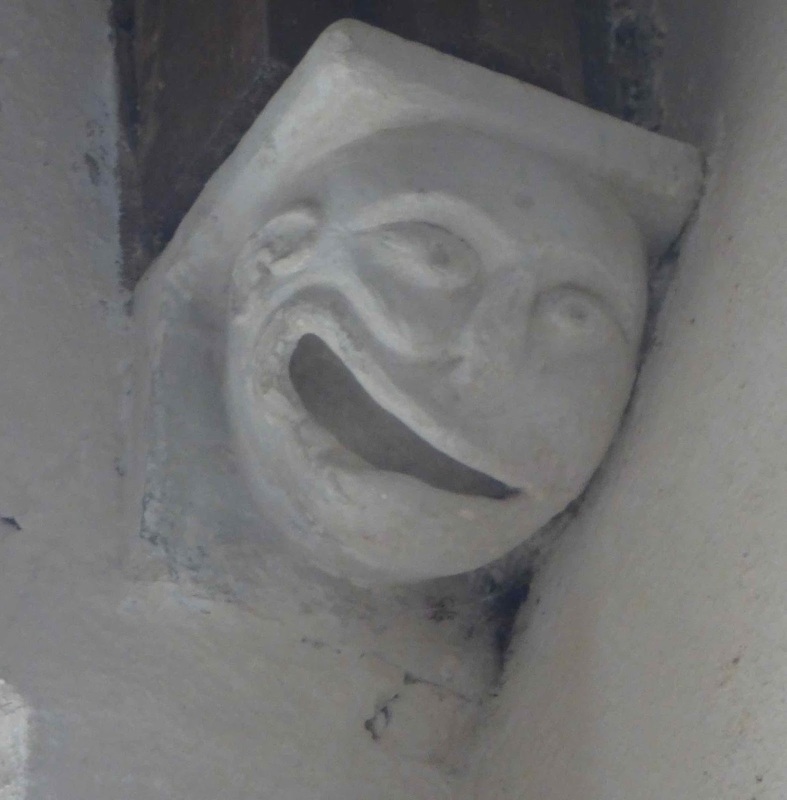 He seems manic, and has the bulging eyes (and apostrophe ear) of some of the other corbels. His mouth is so deeply incised that it appears that his head is completely hollow. 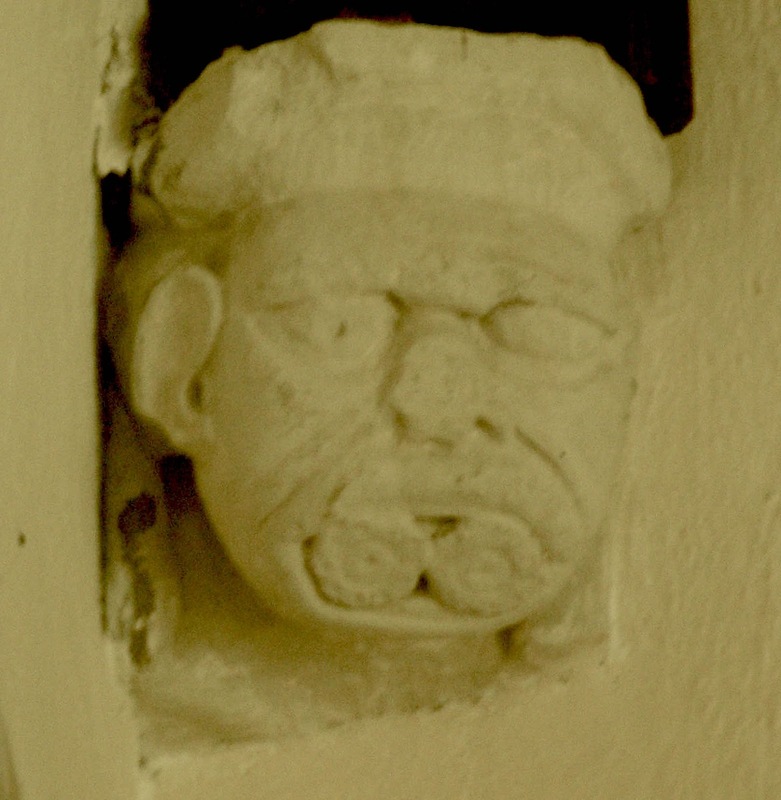 The final corbel, to the right of the monument, is much less sculptural than the others, being almost two-dimensional, and is presumably from a different hand. His stylised centre-parted haircut and prim expression make him seem loveably nerdy. What do these corbels mean? It's a commonplace of writings about medieval churches to point out that the images to be found in them - stained glass, wall paintings, carvings, etc - were intended as a biblia pauperum, a Bible of the poor, for the benefit of the largely illiterate congregation. 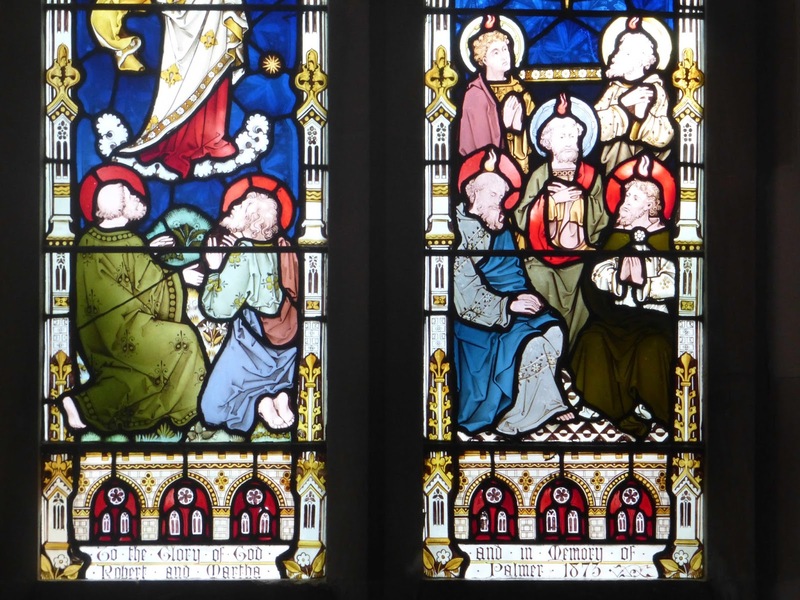 It's no surprise to find, for example, Bible stories illustrated in medieval stained glass, and it's easy to imagine the priest using them to educate his parishioners in the basics of their faith. 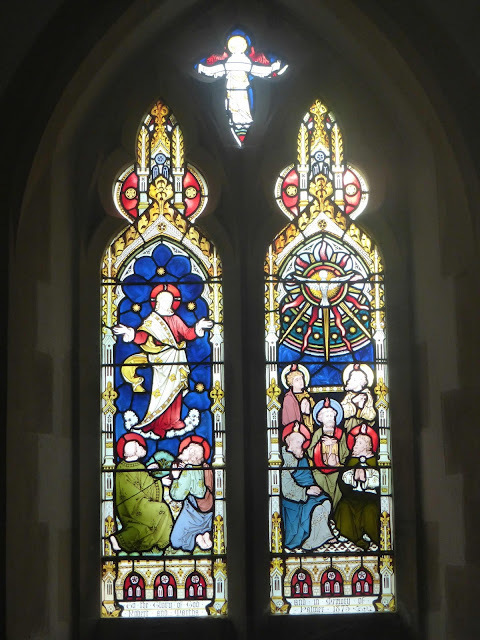 So it's strange that so many images in churches seem to have no didactic purpose (recently I've written blogposts about the surprising existence of explicit sexual imagery in some churches; see here and here). 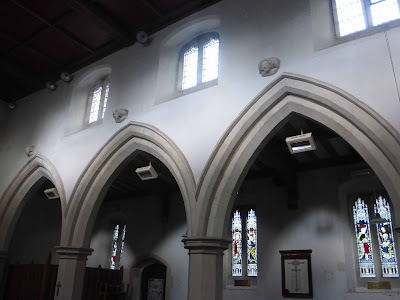 It's hard to see what Christian message these corbels could have been intended to convey; why did the church authorities and whoever paid for the building of the aisle in the early 14th century tolerate (or, who knows, connive with and encourage) their carving? 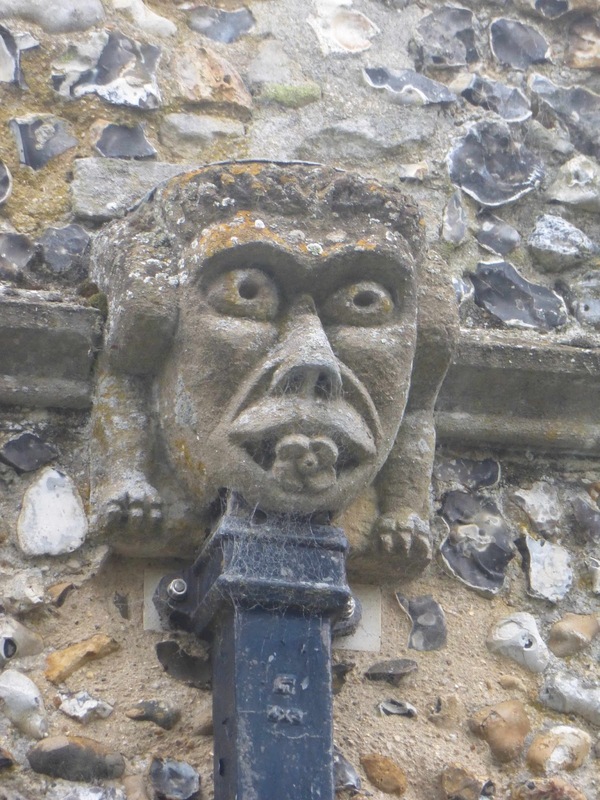 Grotesques are so common in churches that it's easy to assume that the masons were given a free hand, especially in out-of-the-way regions of the building, and that they let their unfettered imaginations run free. Maybe the meaning of these corbels is simply that they no meaning, except for the private and unknowable impulses of their makers. In the nave are a further eight carvings, much more sophisticated judged as works of art but much more orthodox and thus much less interesting. 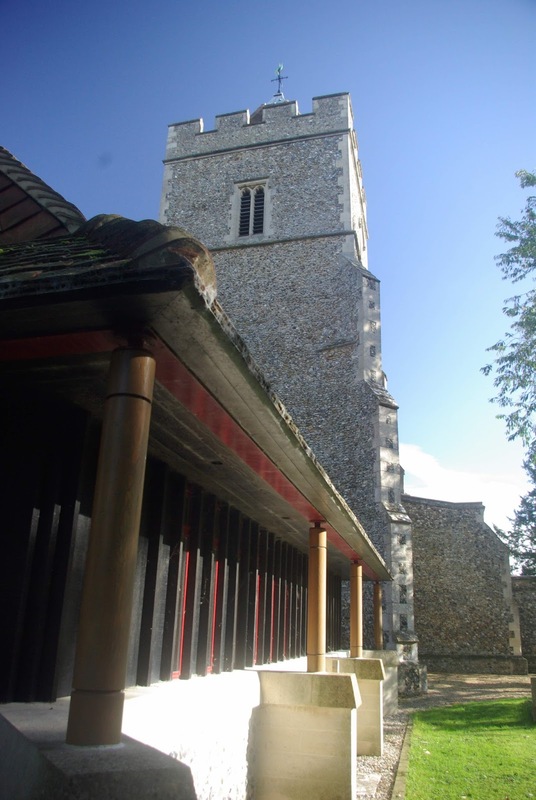 The north arcade is late 13th century, while that on the south is a few decades later (early 14th century). When the current clerestory was built in the 15th century the six corbels intended to support the roof were misaligned with the nave arcades, as the photo above shows. When the nave roof was replaced in the 19th century the vertical posts were removed, so now they support nothing. 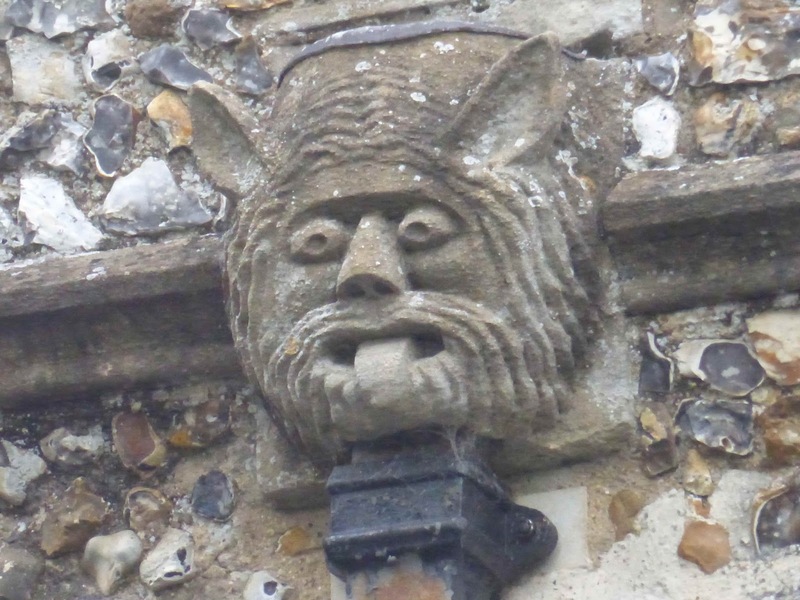 On the north are these three heads, one ugly, two rather handsome. 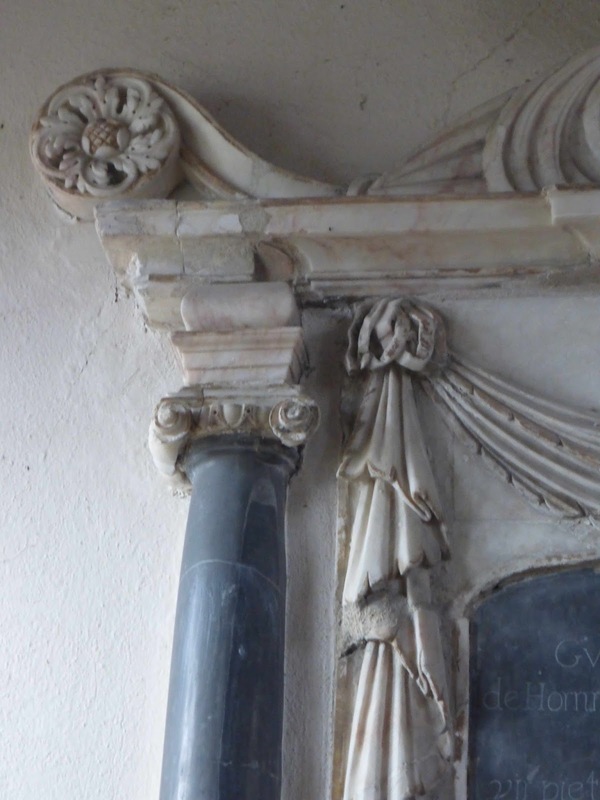 The one at the top appears to be by a different hand to the other two (notice for example that the stone behind him, the actual corbel, is more carefully carved), but must be contemporary with them. 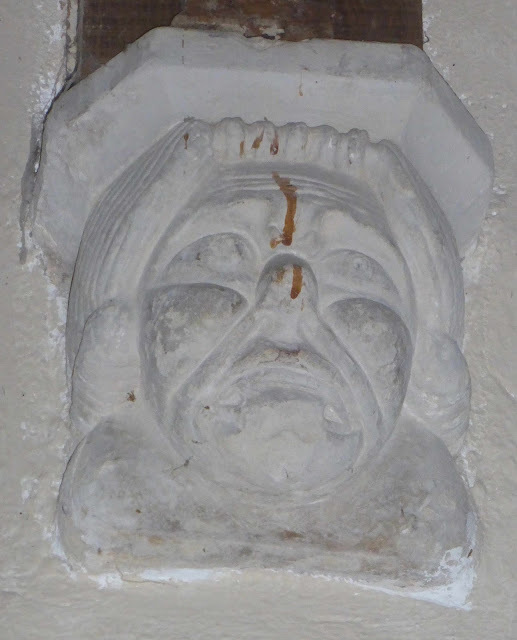 The older ugly man, with his pug nose, very pronounced lips, furrowed brow and attempt at a youthful hairstyle, is a wonderfully powerful piece of character carving. 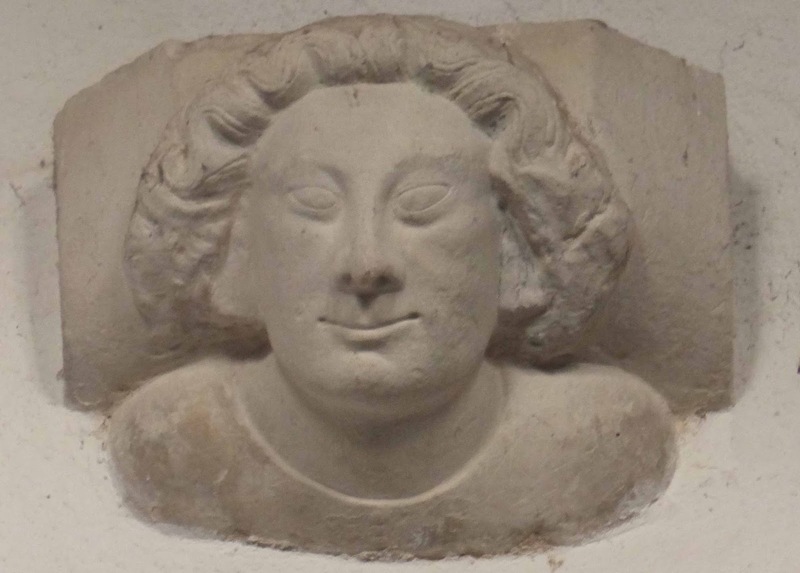 The next one down, with slanted eyes, bouffant hair and Delphic smile, is highly intriguing. What does he know that he's not telling? The last one, with long nose and foppish hair, is less individual than the other two, but still has a strong presence. On the south of the nave the three corbels depict angels, imagined as winged heads. 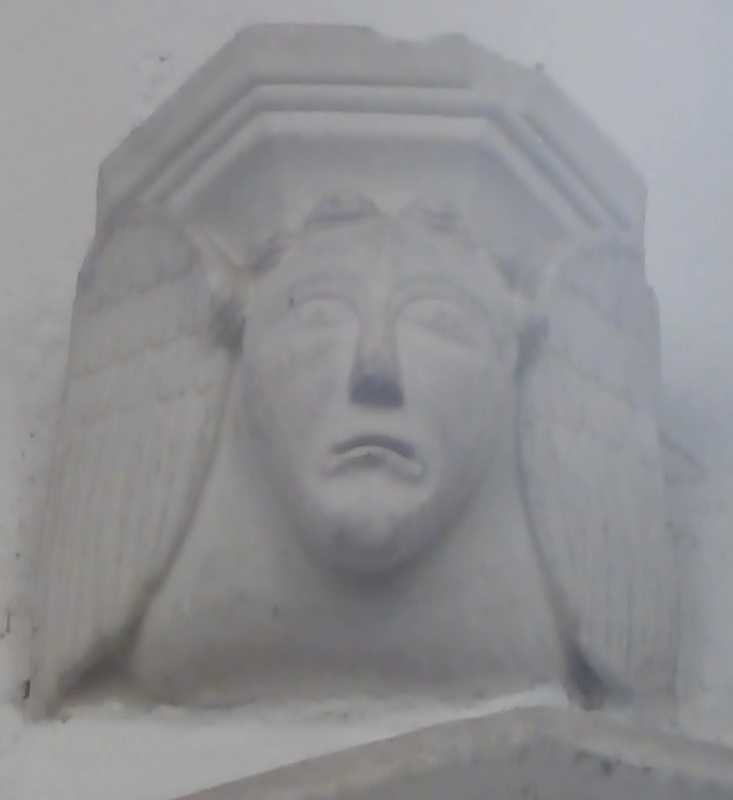 The wings are more or less identical, but the sculptor has made all three different characters; note their varied hairstyles, for instance. Why on earth (or, more accurately, why in Heaven) is the middle one looking so aghast? It looks as if he's contemplating all the horrors of the world, in complete contrast to the quietly assured smile of the head on the north. The late 14th century tower arch has a pair of label stops, both depicting steely-eyed, serious-looking women. 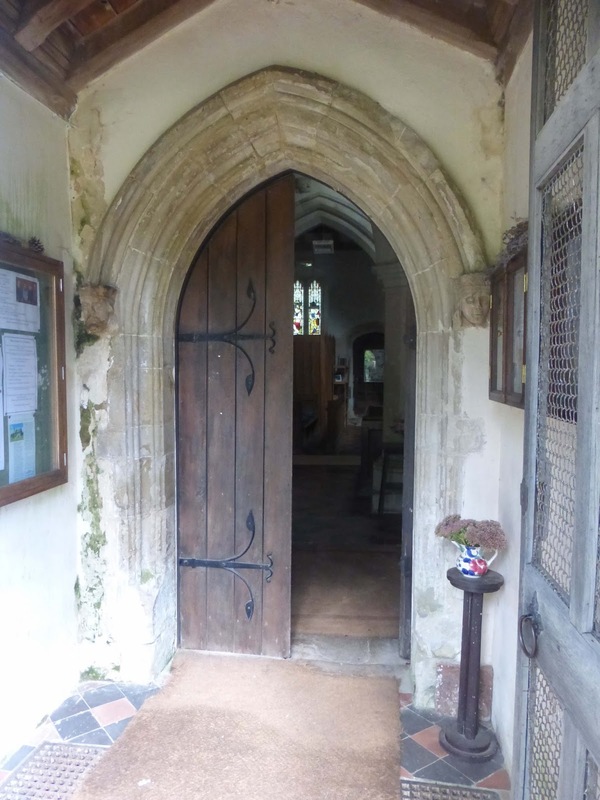 The south doorway is ascribed the the 15th century, and the two label stops are presumably contemporaneous. They show a king and queen, and some details have been picked out in ball-point pen or similar; perhaps this act was intended to be constructive, but the result amounts to vandalism. There are two notable monuments. 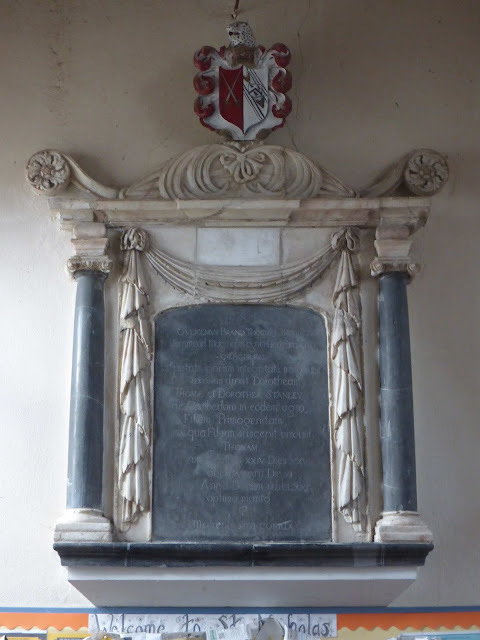 The first is at the west end of the south aisle, and is to William Brand, among the last of a wealthy local family, who died in 1746/7**. This an ambitious and successful memorial; I particularly like the swags and their knots. 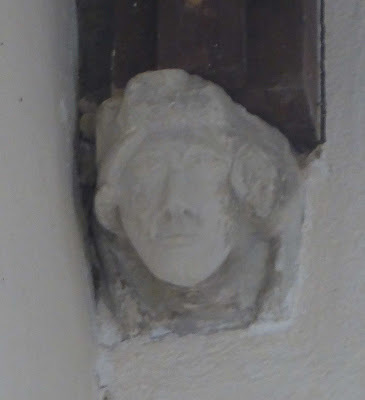 Above the coat of arms is a spike in the wall on which a heraldic helmet would originally have hung, now alas long gone. On the north wall of the chancel is this monument to Lieutenant Colonel Stables, who 'fell, gloriously, at the close of the action while commanding a battalion of the Grenadier Guards' at the Battle of Waterloo in 1815 (in which of course Napoleon was finally defeated). Apparently 'his body found a soldiers*** grave near the field of Waterloo'; this might mean that he was dumped in a hole with lots of other corpses. 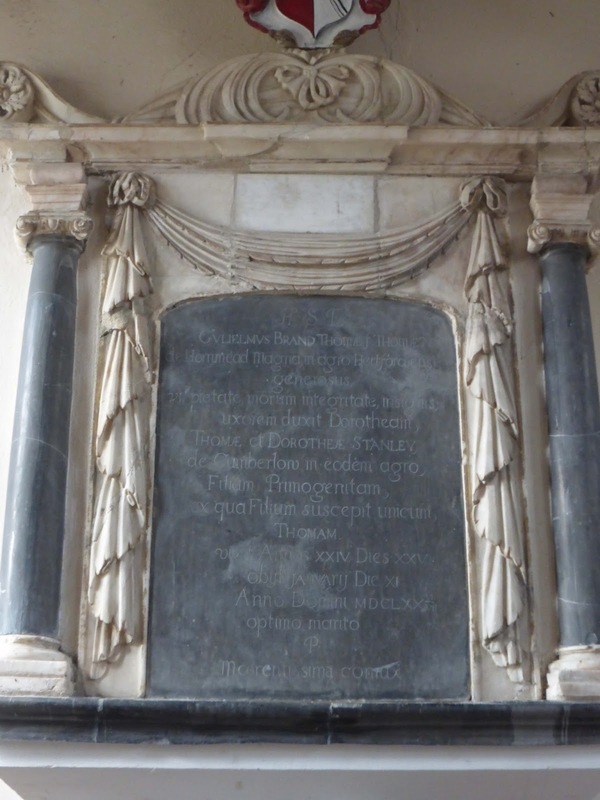 The monument is by Joseph Kendrick (1790-1832), a minor sculptor who never quite established himself after a promising start, and sadly died in poverty at only 42. 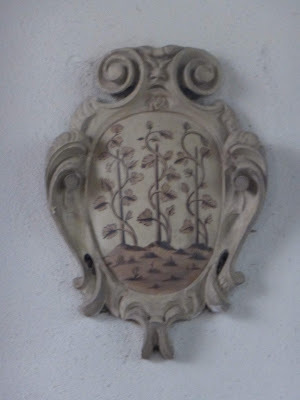 The carving of the heraldry and accompanying objects at the bottom is remarkably delicate. 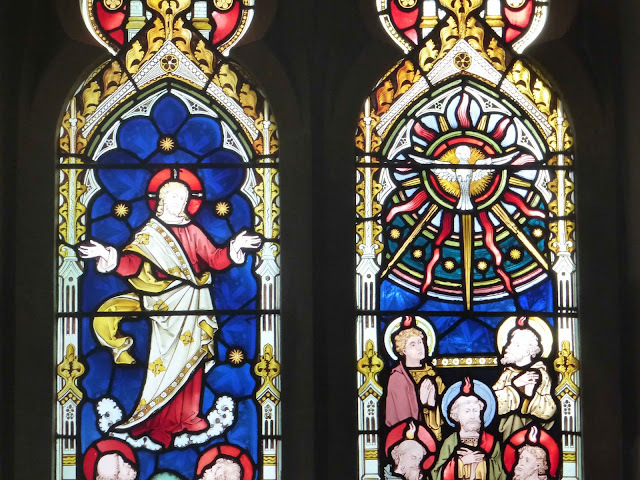 The two best windows are two of the earliest. 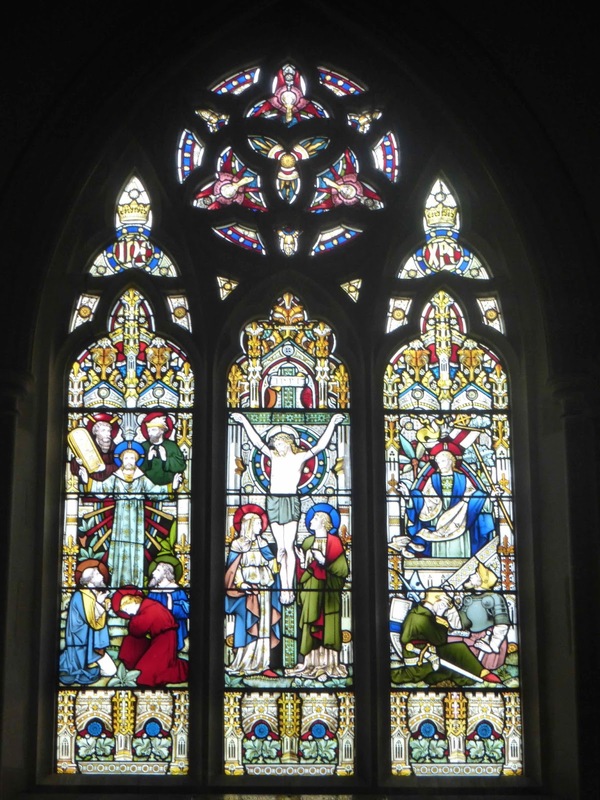 The east window of 1859 is attributed to Harry Burrow, about whom I can find little information. 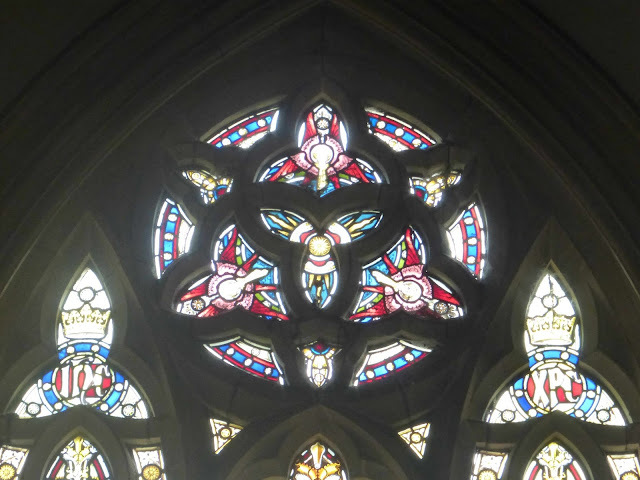 He's mentioned only in passing in Martin Harrison's Victorian Stained Glass; he was associated with the Aesthetic movement, and joined the firm James Powell & Sons in 1872. The Church Stained Glass Windows website, which covers most of the southeast, attributes no other windows to him except two minor ones also in Great Hormead. On the strength of this east window, he should be very much better known. 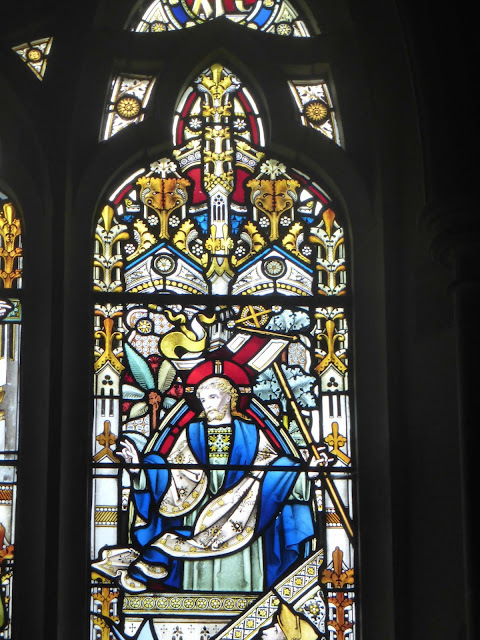 The south window in the chancel of 1873 is attributed to the much better known Nathaniel Westlake (1833-1921), who joined the firm Lavers and Barraud in 1858 and became a partner a decade later (and sole proprietor in 1880). 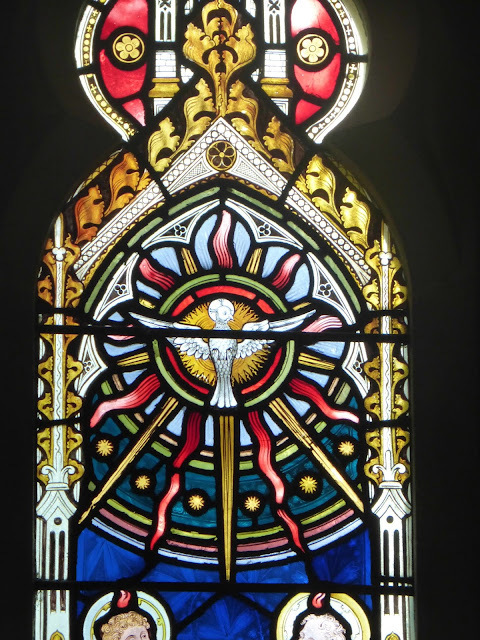 The two lights show the Ascension and Pentecost; the highly stylised Holy Spirit at the top of the latter is an especially powerful combination of colour and geometry. Facing this window across the chancel is this small but elegant cartouche, showing three hop poles. It belonged to the Houblon family (houblon is French for hop pole), who owned Hormead Hall from the late 17th to the early 20th centuries. The cartouche must date from near the beginning of their tenure. The very recent parish room, unusually sited immediately to the west and connected to the west door by a glass corridor, would have earned Alec Clifton-Taylor's approval, being built of similar materials to the church - limestone, flint, wood and tiles. 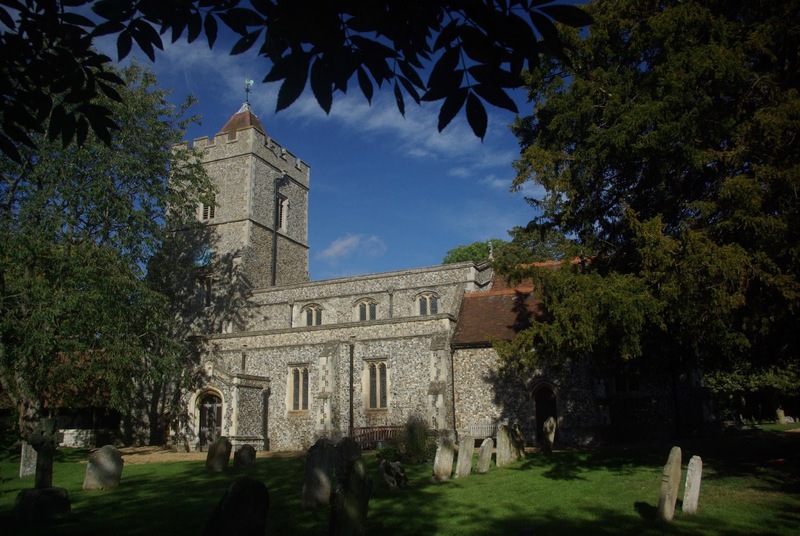 Architecturally, Great Hormead church is of only limited interest, partly because it was thoroughly restored in 1872-4 by Arthur Blomfield (1829-99), who more or less completely rebuilt the chancel and renewed most of the external features, such as the window tracery. However, some exterior details escaped his attentions. 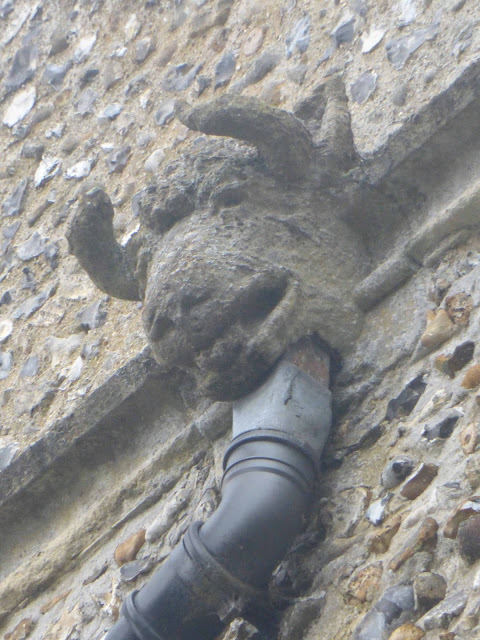 High on the east face of the tower is this rainwater head in the form of a bull, sticking its tongue out at the onlookers below. It's quite weathered, and must date from the building of the top section of the tower in the 15th century. The pipe emerges from his throat rather than his mouth. 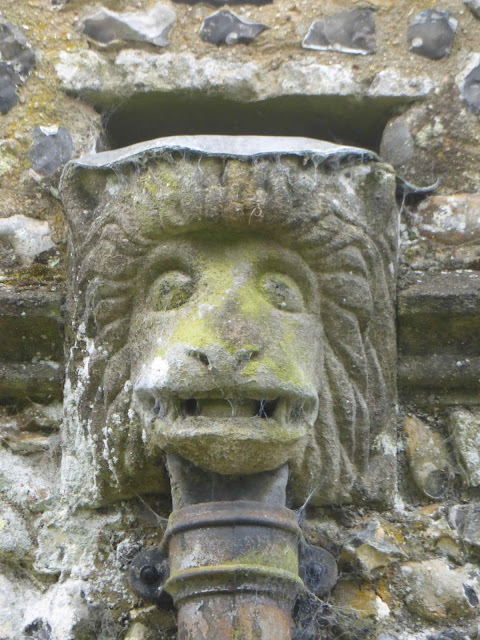 Each aisle has two lion rainwater heads, all very similar but not quite identical. 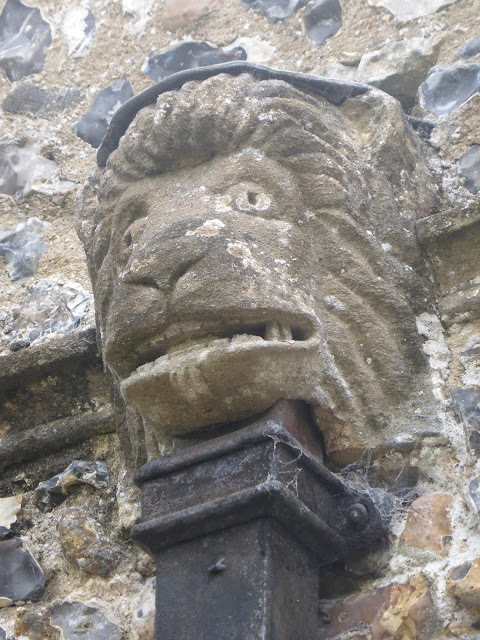 They roar but rather genteelly, as is only appropriate for beasts of the sedate Home Counties. The clerestory has two grotesque rainwater heads on each side. 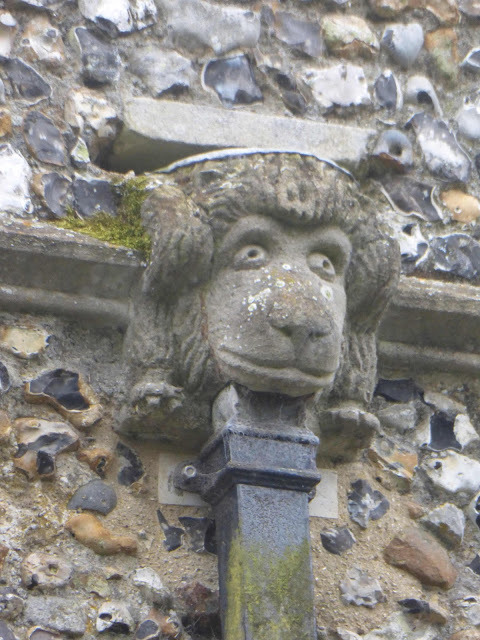 The second one pictured above has obvious similarities with many of the corbels in the south aisle: the bulging eyes and prominent cheekbones, and what's more holds what is clearly a flower in its mouth (you'll remember that one of the corbels has what looks like two flowers in its mouth). 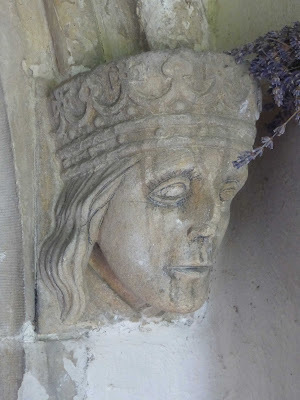 Can these heads be contemporary with the corbels? 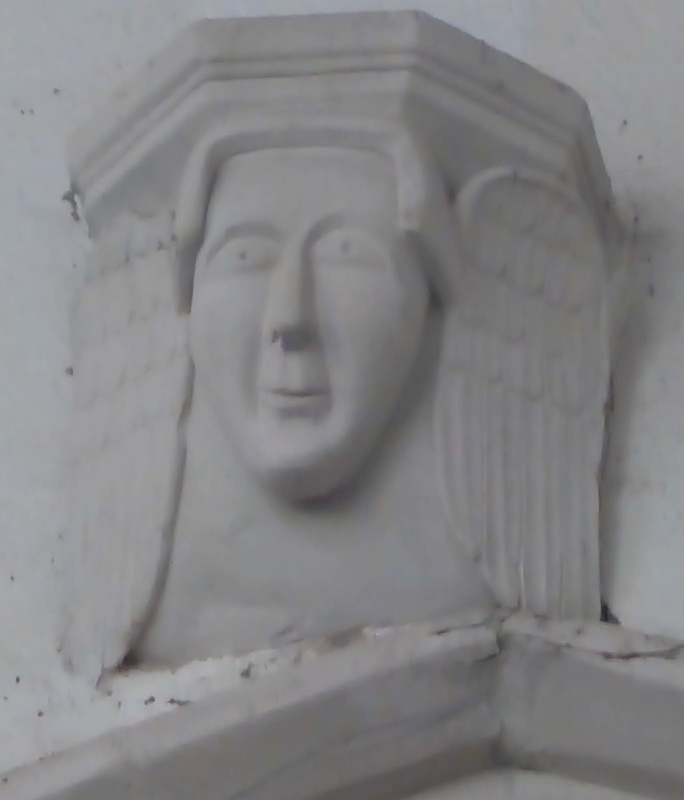 Or do they date from the building of the clerestory sometime in the 15th century? Or could they even be Victorian? They're not very weathered, though they are pretty and prettily lichened. I think they must be medieval. However old they are, they're great. I especially like the shaggy third one down, who looks cutely strokeable, and the last one who seems to be doing his best to appear frightening but ends up looking like a dog eagerly waiting for his master to throw him a stick. Great Hormead church is open during daylight hours, and, while it's no architectural gem, there's plenty to enjoy if you're willing to use your eyes. * 'Stiffleaf''s excellent Hertfordshire churches website suggests that the cat corbel (and possibly some of the others) is a reused 12th century carving. 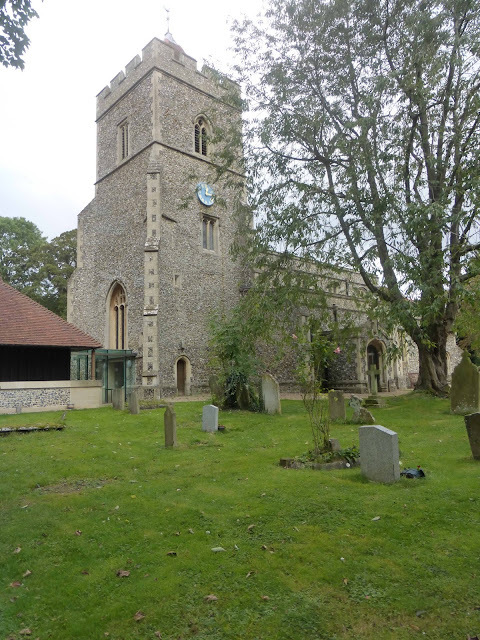 This is possible; it does look a bit Norman, and there was probably an earlier 12th century church on the site of the current church. 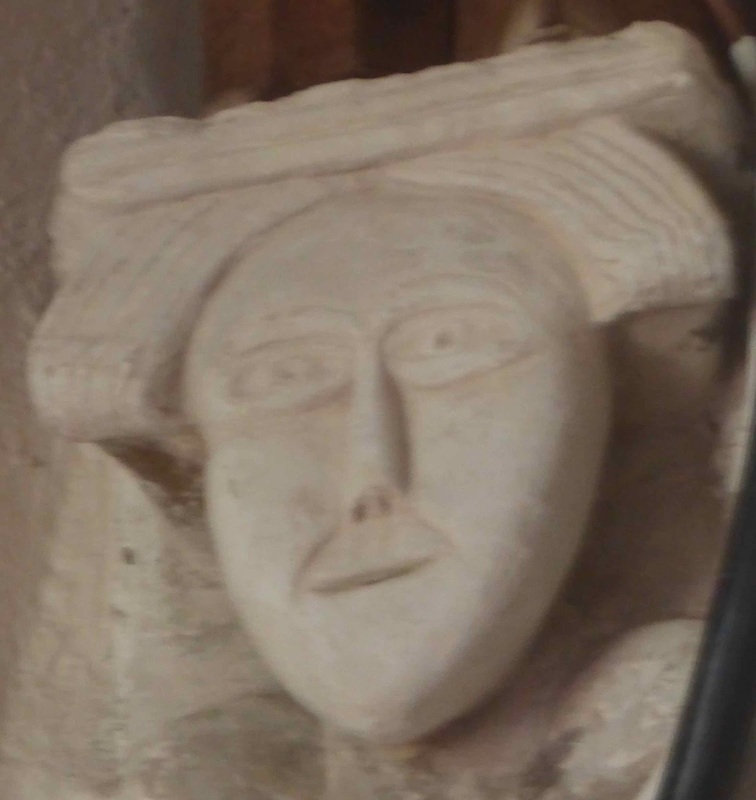 But I think it's more likely that the 14th century sculptor was untutored and unaware of contemporary styles of carving, and produced his own version of earlier corbels he'd seen in local churches. 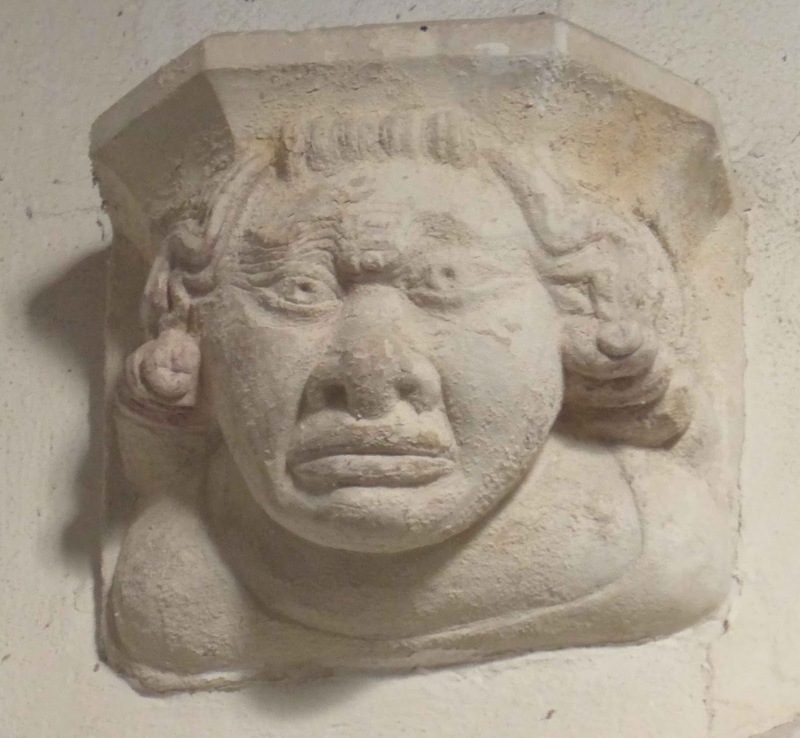 The cat corbel seems to me to be by the same hand as several of the others, for example the scowling man (see the bulging eyes and pronounced cheekbones), and they don't look Norman. ** The curious double date arose because in 1747 Britain was still using the Julian calendar, in which the official New Year was March 25th. 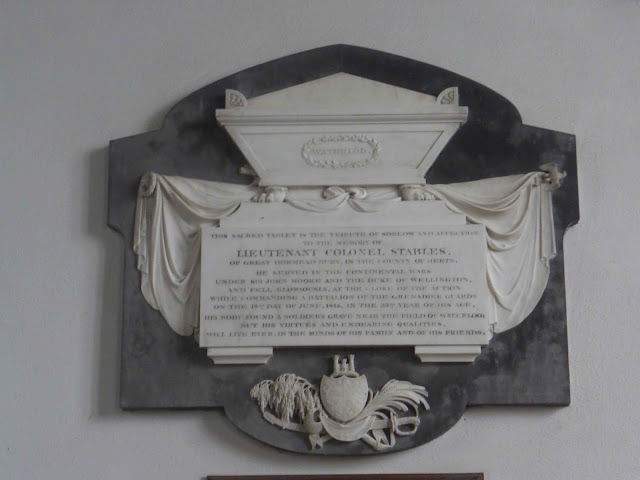 As the death occurred in January, by that reckoning Brand died in 1746. However, most people by the 18th century accepted January 1st as the de facto New Year, so by that reckoning he died in 1747. Both dates are given to avoid confusion (though as these facts are now generally forgotten, the double date creates confusion. See my rant about the illogicality of starting the year in January). *** No apostrophe in the original.